Need a living space for your rabbit? 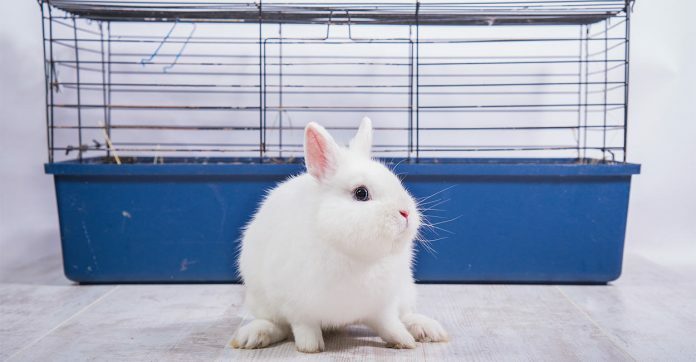 Check out our guide to the best indoor rabbit cage! Rabbits are undeniably cute and fluffy. They are also very popular pets both in the States and in the UK! Recent estimates suggest there may be anywhere from 1 million pet rabbits in the UK and anywhere from 3 to 7 million rabbits in the States – that is a lot of pet rabbits! This also means there are lots of new rabbit keepers who have lots of questions about rabbit care, and especially rabbit housing! For instance, how much space does each adult rabbit need? What is the proper layout for an indoor rabbit cage? How can you keep your indoor rabbit safe from other pets? In this article, learn everything you need to know about picking the best indoor rabbit cage for your fluffy new addition! You may be wondering whether it is better to keep your rabbit outdoors or indoors. This is an excellent question and also one that is hotly debated between rabbit enthusiasts! There will probably never be total agreement on whether indoors or outdoors is better for pet rabbits. But there are some definite advantages to keeping your rabbits inside with you in an indoor rabbit condo. In some cases, it can make sense to keep your rabbits outdoors. If you are able to provide sufficient security from predators and reliable protection from the elements and the seasons. However, in most cases, an indoor rabbit house will be better able to accomplish both goals for you and your rabbit. For instance, indoor bunny cages will automatically be temperature controlled and secure. You can also more easily keep an eye on your bunny and make sure he is safe, healthy and happy. And you will be able to have more interaction and build trust with your rabbit when he lives inside with you. 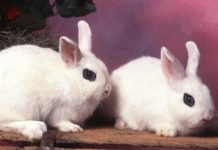 As well, the more you learn about rabbit personality, the more you will be able to put yourself in your rabbit’s shoes. Imagine how much more secure you will feel when living indoors! After all, in an outdoor setting, a rabbit is a small, tasty prey animal situated right smack dab in the middle of the food chain. For this reason, a rabbit outdoors is always on high alert for predators and other dangers. It is no wonder both wild and domestic rabbits have developed shy, quiet personalities. So they can forage and sleep and care for their babies without calling attention to their presence. It is also easy to understand why rabbits startle easily and have a strong need to find good hiding places. Most of all, it just makes sense that rabbits may initially be slow to trust humans and allow themselves to be handled. After all, it can be hard to tell who wants to cuddle with you and who wants to serve you up on a platter! As a rabbit owner who understands what it might feel like to be a rabbit, you start to intuitively understand what your rabbit needs to feel comfortable in an indoor rabbit habitat. Rabbits often try to hide illness. If your indoor rabbit gets sick, you will probably notice more quickly so you can get veterinary help right away. Wild rabbits are actually quite sociable, and your rabbit will more easily learn to trust you and enjoy interaction when living indoors with you. You will learn a lot more about your rabbit when she lives inside with you because the proximity makes it easy to spend quality time with your pet rabbit. It is likely your pet rabbit will also enjoy a longer lifespan when provided with a lower stress indoor rabbit condo. So now let’s take a look at how to pick the best indoor rabbit hutch for your precious rabbit! Loosely translated, this term means that the rabbit in question lives indoors and has no official habitat, per se. The rabbit is “free range” and can go wherever she pleases to sleep, play and take care of her personal needs. 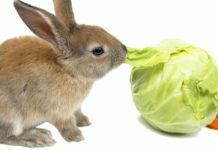 Since it is possible to potty train a rabbit (in a very similar way to how a cat can be trained to use an indoor litter box), this arrangement can work for some rabbit owners. But clearly, this type of situation is not for everyone! This is especially true if your household includes other pets, children or people who aren’t keen on rabbits or litter boxes. Providing an indoor hutch for rabbits is generally considered preferable for your rabbit’s safety and comfort, as well as for your peace of mind and sanity. Your rabbit needs ventilation, which means glass aquariums are never suitable. Avoid wire flooring which can be very hard on your rabbit’s soft feet – a soft mat or cardboard base is much more comfortable. Aim for a size that is four times as long and two times as wide as your adult rabbit – this does NOT include a play area to hop and run. Larger is always better in terms of hutch size! Be sure there is sufficient interior space to offer separate hiding, feeding, potty and sleeping areas inside the hutch. Be sure the cage can accommodate at least one smaller enclosed area for hiding. Your chosen indoor rabbit cage should be rabbit-proof (i.e. escape proof). 4.4 pounds or less: 1.5 square feet plus 14 inches height. 8.8 pounds or less: 3 square feet plus 14 inches height. 11.9 pounds or less: 4 square feet plus 14 inches height. Rabbits more than 11.9 pounds: 5 square feet plus 14 inches height. Keep in mind that these are the minimum recommended cage sizes and do NOT include your rabbit’s daily play and hopping needs. If you can provide more space inside of an enclosed indoor area, that is even better. 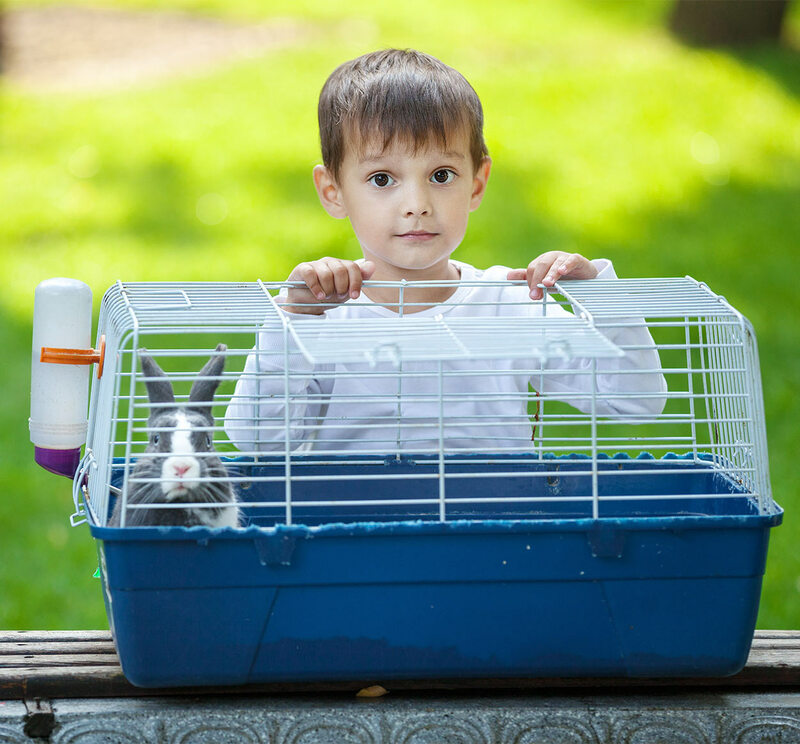 The other option is to allow your rabbit some out-of-cage time each day to hop and run and play freely. You should also double the recommended minimum hutch space if you are keeping more than one rabbit together. Keeping two or more rabbits together is recommended, since rabbits really thrive in the company of other rabbits! TIP: This handy square footage calculator can help you determine if a habitat you are considering is suitably spacious for your rabbit, either in terms of simple living space or living space plus play space. These large indoor bunny cages are worth considering for your rabbit’s large indoor rabbit hutch. At 42L x 28W x 14H, this small indoor rabbit hutch offers about 7 square feet of space for your rabbits. For multiple rabbits, you can connect more than one set together to make a roomier play and living area, and this can provide plenty of space for an economical price overall. The setup is easy and fast and you can use a soft mat or cardboard surface for your rabbit’s feet. You can also add other extras as desired to separate out areas for hiding, feeding, potty and play. At 55.91L x 23.62W, this double indoor rabbit cage provides just over 8 square feet per rabbit. With the addition of a hiding area on one end, making it suitable for one or more adult rabbit occupants. This highly rated all-inclusive design automatically separates out different areas for feeding, hiding, potty and play, making it easy for you to clean and maintain your rabbit’s habitat. It also comes with extras: a water bottle, hide box, food bowl and attached hay feeder. While this cage is marketed as a guinea pig habitat, it can also serve very well as a roomy habitat for one or more rabbits. It provides 7.8 square feet, but if you have several rabbits and need more space, you can attach two cages together to expand. The habitat comes with a soft PVC bottom liner and a top mesh cover to keep rabbits and other pets safely separated. A two tier rabbit cage indoor can be one way to provide your rabbit with more space. However, you do need to make sure that the ramps are sufficiently wide to accommodate your breed of rabbit (some rabbit breeds can really grow large!). This two story rabbit hutch indoor isn’t the most economical option on the market, but owners say it is really sturdy and well built. And the casters make it easy to move this indoor rabbit cage on wheels as needed. Each level is 43L x 28W x 50H, giving your rabbit a square footage of just over 8 square feet for each level. This hutch also features a pullout tray and feeding bowl for each level. This really cool two story rabbit cage indoor made of fir wood measures 58L x 21W x 34H, giving your rabbit just under 8.5 square feet in floor space per level. Plus, it has a cool ramp system that leads up to an enclosed area for nesting or hiding! This really cool two tier giant indoor rabbit cage has two ramps that lead up to a central enclosed hiding area. Underneath and to each side is a free range open play area. With just over 26 total square footage, this can make a nice indoor fully enclosed indoor rabbit cage for 2 rabbits or more. If your indoor rabbit cage plans require that you provide a fully enclosed indoor space for your rabbit to live, eat, sleep and play, these indoor bunny hutches definitely deserve a second look. Each one is attractive, functional and sufficiently spacious to serve as an indoor rabbit cage for 2 rabbits or more. This highly rated and popular wooden indoor rabbit cage measures 36L x 22W x 30H and provides 5 square feet of floor space. There is also an included hiding area and an easy-access roof. This attractive elevated wooden bunny hutch is barn-red and white. This extra large indoor rabbit cage measures 46.8L x 22.4W x 24H, giving your rabbit 6.7 square feet of floor space to enjoy. This cage offers plenty of ventilation with an inbuilt hiding area, a flat bottom, a water bottle, food dish and access ramp that connects the floor to the small lookout balcony. Owners give this cage very high marks. This indoor wooden rabbit hutch measures 59L x 22W x 33H, giving your rabbit more than 9 square feet of floor space including the enclosed hiding area. This fir wood hutch is very highly rated by rabbit owners and it includes a pull-out tray beneath the hiding area for easy cleaning. What is the best indoor rabbit cage? Choosing among these luxury indoor rabbit homes sure isn’t easy! But perhaps you have found your precious rabbit’s new indoor rabbit cage while reviewing the lists in this article. We would love to know which indoor rabbit house you chose and why you decided to pick that particular cage! DeMello, M. (2013). Living with a House Rabbit. House Rabbit Society. House Rabbit Society (2014). How many pet rabbits are there in the U.S.? Wright, M. (2015). Rabbits – Britain’s 3rd most popular pet are also the most neglected. Stanhope Park Veterinary Hospital. Action for Rabbits (2013). Indoor Accommodation. VetMed UCDavis Staff (2018). Basic Rabbit Care & Housing. Veterinary Medical Teaching Hospital. American Rabbit Breeders Association. (2018). 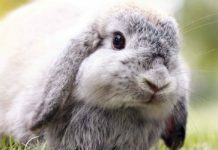 Recommendations on Rabbit & Cavy Care.